Workshare is in the business of understanding change. We have been since 1999 and we're not done yet, because change matters. It's our job to analyse every move, add and deletion in the content you work with, so you don't have to think about it. Fast and accurate document comparison is what we're refining all the time. Legislation and regulation are also changing - take the GDPR for instance. This has been a huge shift for firms and the focus on data security and information security is more stringent than ever. 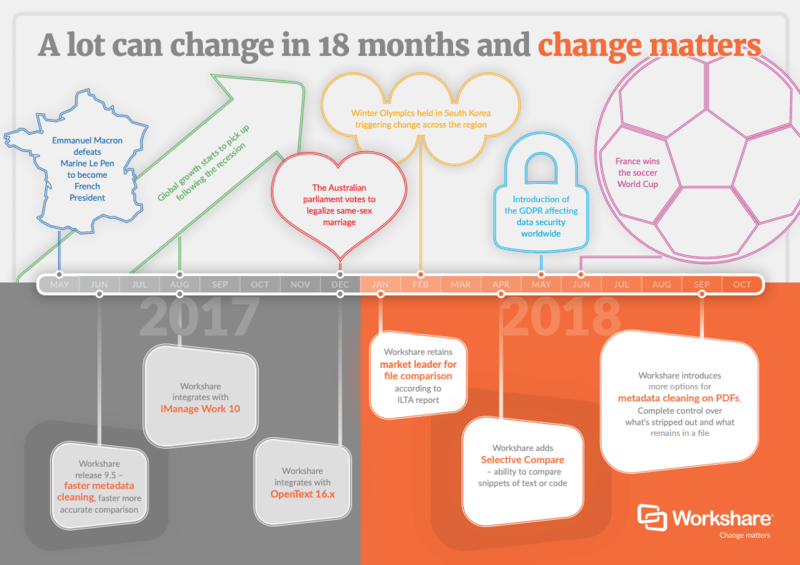 Monitoring this change, Workshare has been designing ways to look for unusual or risky sharing behavior and also ways of preventing data loss. Automatic application of security policies to email, fast metadata cleaning, and risk detection are some of the results. We thought it would be fun to take a glance back over the last 18months. Here are some of the global headlines and a little of what's happened with us and our partnerships too. Enterprises don't want to operate a whole heap of disparate systems and platforms to achieve efficiencies. That's counter-intuitive. Instead, choosing market-leading solutions and integrating them creates a better user experience and it means IT have less of a headache in terms of maintenance. Over the last 18 months, we've continued to develop our partnerships with iManage, NetDocuments and OpenText. Also, other exciting companies such as ContractPodAi and Cognitiv+ have embedded Workshare into their platforms to enrich their user experiences. Listening to clients, Workshare has continued to invest in faster and more accurate solutions, as well as new features like selective comparison. Continuing on the journey of understanding change and how it affects the documents our clients work on each day is a mission we have today, tomorrow and into the future. It would be great to know what you think. With input and user feedback, the evolution can continue. If you'd like to get in touch or ask a question about the changes you manage each day, we'd love to hear from you. Whether that's when you're creating or reviewing important documents to share with others, or when you need to protect the contents of your documents before they're shared.